What’s not to love about a banana? They’re nutritious and delicious. And, you can easily prepare, transfer, and eat these little delights without making a mess. 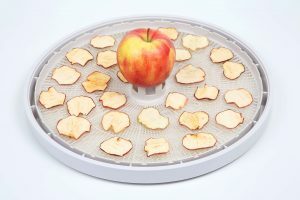 Using the dehydrator will allow you to make an amazing treat without cutting into your busy schedule. Plus, the chips won’t weigh you down or take up precious cooler space. Here is your guide on how to make dehydrated banana chips that everybody will go bananas over. Quality counts and not all bananas are created equal. You should pick a perfectly ripe banana. For this purpose, stay away from the greenish bananas and the bunch that’s brown. 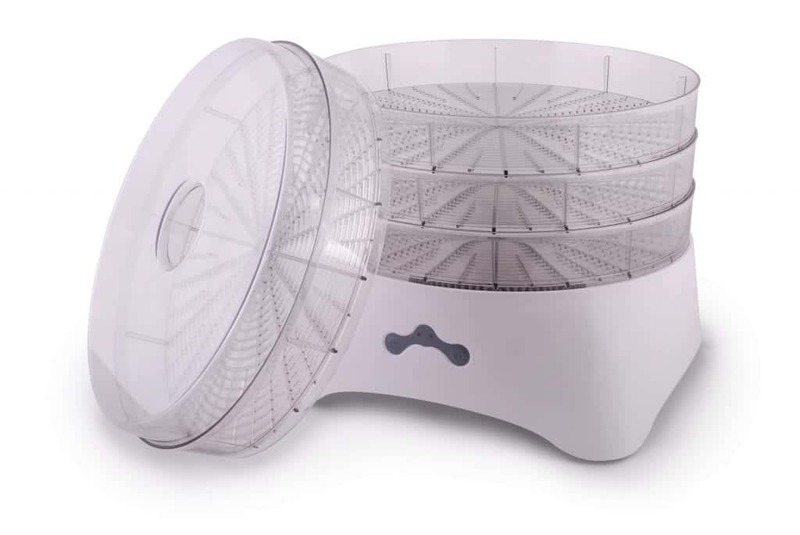 This will ensure that your chips dry properly and taste delicious. Chill 6-7 bananas in the refrigerator for an hour to firm them before cutting. Cut them an even 1/4 inch thick. This will ensure the perfect slices for dehydrating. Plain banana chips taste great, but why not pack a little punch for your camping trip? 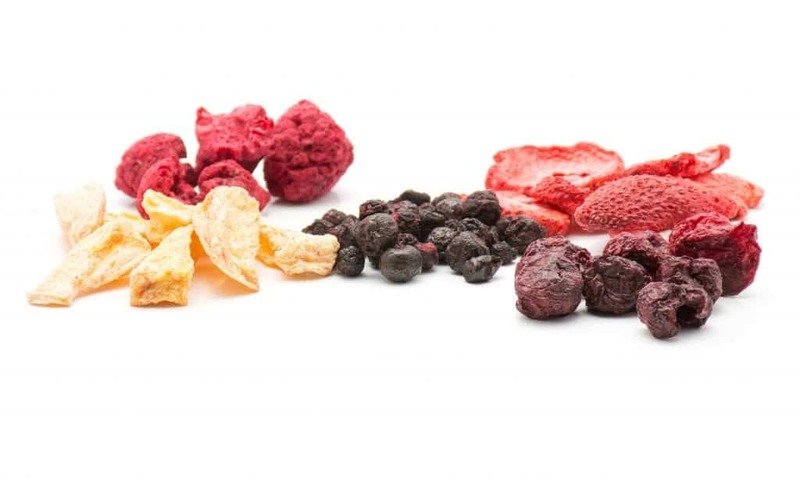 Choose from one of these funky flavors, or make a variety, to satisfy everybody’s hunger. Add a little zing to your chips with dry one of these spicy flavorings. Adding 2 tsp of cinnamon will warm up the flavor without overdoing it. Especially perfect for kids. Garlicky and sweet with just a pinch of heat, makes a perfect snack to eat! Seriously, Siracha is all the rage these days and will pleasantly surprise all of your friends at camp! Just add a few shakes to coat the banana slices before dehydrating. This mix will kick it up a notch on a chili camping trip. For a blaze of flavor, coat the banana slices in 2 1/2TBS of honey and 2 teaspoons of cayenne pepper. Sweet sizzlers. 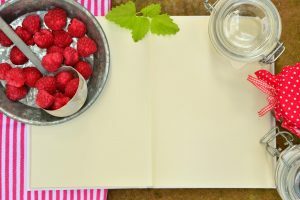 If you want to skip the spice and make a dessert alternative to s’mores, try adding some of these ingredients. Okay, so this still adds a spritz of spice but will make a delectable sweet camping treat. Add 2 1/2TBS of honey and 1/2tsp of ginger for a little snap. For a late campfire snack to share, make your chips with 2TBS of pure maple syrup, and 1tsp of bourbon. Perfect for camping with the boys. Bring the tropics to the woods by coating the banana slices with 1/2TBS of coconut oil and 1 1/2TBS of coconut sugar. You’ll go coconuts over these super sweet dried banana chips recipe. Peanut butter banana chips make a perfect dessert, but also pack in energy-rich nutrients for a challenging hike. Mix your pre-dehydrated banana chips with just under a half cup of creamy peanut butter; you won’t be disappointed. Do you want to get real woodsy wild? 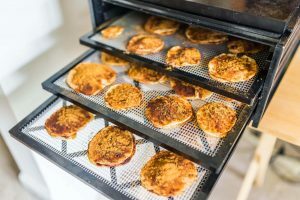 Learn how to make dehydrated banana chips that bite back a little. Rub your bananas in 1/4 cup of fresh cilantro and a couple squeezes of lime juice to make your tongue dance the samba. It’s thyme to take things to another level. A couple squirts of fresh squeezed orange and 1/2tsp of thyme will leave you feeling like there’s never enough thyme in the world. If you’re trying to keep the vampires away, or simply impress your friends with a sophisticated taste, mix your pre-dried banana slices with 1tsp of garlic powder, 1tsp of dried parsley, and 1/4 cup of parmesan cheese. You may want to use plantain as a substitute for a banana with this flavor, to eliminate all sweetness. Once you choose your flavor and slice your cool bananas, you’re ready to make your chips! 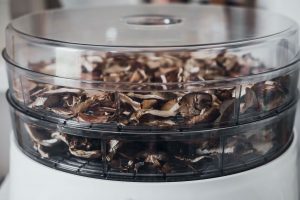 Since we are talking about making enough chips to last an entire camping trip, you may need to split this process up into two or three times, depending on the size of your dehydrator. But don’t worry. 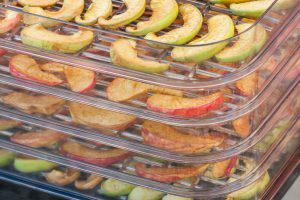 You expand the shelf life by dehydrating the fruit and can store them for weeks before your camping trip. 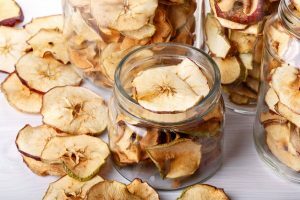 You do not want to ruin your perfect banana chips dehydrator recipe by storing them improperly. They require dry storage and you should take measures to prevent any moisture from getting in. You will taste the difference between a properly stored chip and one that got exposed to moisture. Why Choose Dried Banana for Camping? 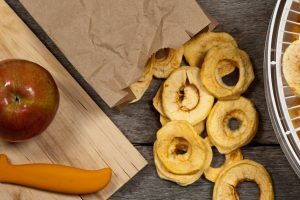 Banana chips are simple to make, store, carry, and eat, they taste great and allow you to enjoy banana health benefits in a fun, creative snack form. Banana chips provide fiber, which regulates your blood sugar and keeps you feeling satiated for longer since it takes a long time to digest. This is perfect when you’re hiking, fishing, or participating in other outdoorsy activities that take a long time. 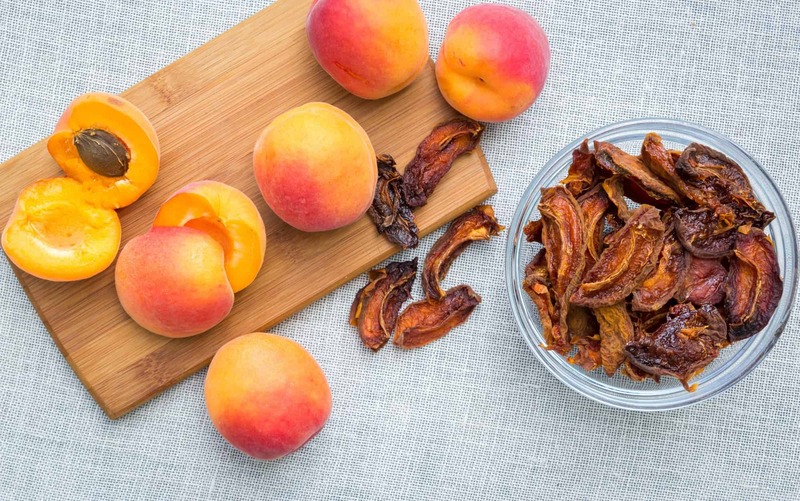 These crispy snacks also provide iron and potassium, which will battle fatigue from long days camping. They are super high in sugar and fat, but for camping, especially on a trip that keeps you super active, that may be desirable. Just grab them and stay healthy and satiated anywhere! Now that you know how to make dehydrated banana chips, you have an easy anytime snack for your camping trip. 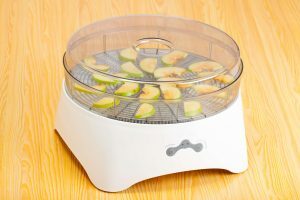 Equip yourself with the best food dehydrator for making your amazing banana chips that will drive everybody wild! 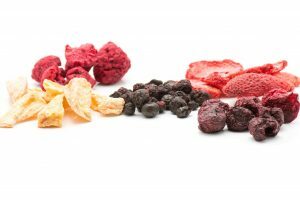 Also, visit Dehydrated Foodz for more dehydrating tips and amazing snack ideas. 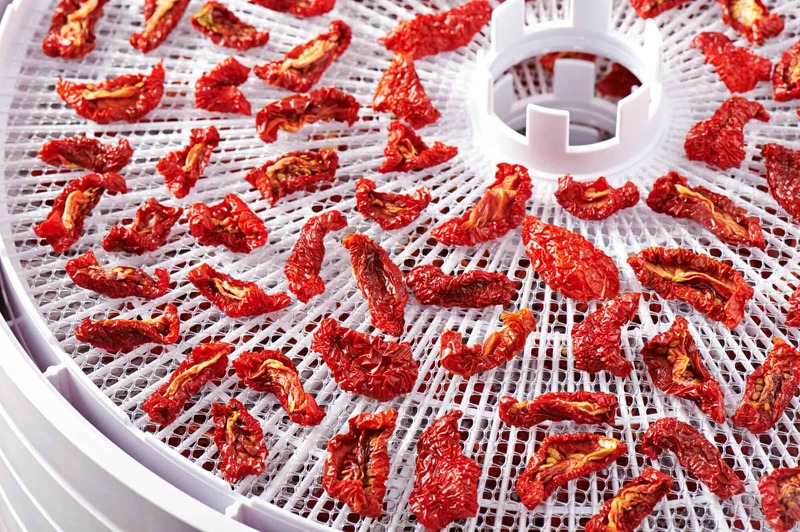 For questions about purchasing a dehydrator, contact us. We look forward to hearing from you!